So Far Solar ME3000SP is a battery storage management unit which allows AC coupled battery storage. There are significant benefits to using AC side battery storage. In particular is the ease of compatibility for the wide range of renewable energy systems – the So Far Solar ME3000SP will work with all single phase solar systems, and allows an expandable battery solution for the home, domestic and commercial use. Always confirm requirements with relevant organisations such as DNO’s when installing battery systems. Solar Battery Storage is growing in demand. The SoFar ME3000SP battery storage system is simple to install to manage the solar electricity generated from a solar panel system. Simple compatibility – the SoFar ME3000sp AC coupled battery storage system functions regardless of what set-up is present on the DC side. This means the SoFar ME3000sp AC coupled battery storage system will work with String inverters, Dual string inverters or Twin Tracking inverters, Micro-inverters such as Enphase, solar optimisers such as the Solar Edge Battery storage requirements, or even wind turbines. As long as whatever renewable technology is employed converts the energy it generates into AC electricity, it can work with the So Far Solar ME3000SP. Simple Matching – the SoFar Solar ME3000SP AC coupled battery storage system can be matched to virtually any solar or even wind powered system. The So Far Solar ME3000SP AC coupled battery storage system monitors the renewable power once converted to AC electricity. Therefore the SoFar Solar ME3000SP AC coupled battery storage system has non of the compatibility issues which can be present with DC battery storage systems, typically caused by string set-ups, or voltage inputs, or voltage outputs! This AC Battery storage solution attaches to the consumer unit, meaning that the SoFar ME3000SP simple adds on lower down the system. Simple installation – the SoFar Solar ME3000SP AC coupled battery storage system is wired directly into the customer’s consumer unit. Therefore the simplest place to locate the SoFar Solar ME3000SP AC coupled battery storage system is close to the fuse board of the property. The SoFar Solar ME3000SP AC coupled battery storage system does not need to be installed near the inverter. This means that all the necessary cables are generally available to clamp around for the sensors. There are 2 CT sensors which need to be correctly located to provide the SoFar Solar ME3000SP AC coupled battery storage system with electrical flow information – the mains incoming AC supply to the property for monitoring power in and out, and the AC generation from the renewable source (which generally comes down to the fuse board on a single AC feed, or to a small dedicated consumer unit). The SoFar Solar ME3000SP AC coupled battery storage system needs a separate MCB off the existing fuse board (consumer unit). There is no plug point needed, as it can take any required power from this AC connection. The batteries must be located within 2 meters of the SoFar Solar ME3000SP. So to summarise – on AC supply from the fuse board to the SoFar Solar ME3000SP, 2 CT sensors to be fitted, and the battery pack to be installed close to the unit. See the installation manual of the SoFar Solar ME3000SP AC coupled battery storage system for specific details. 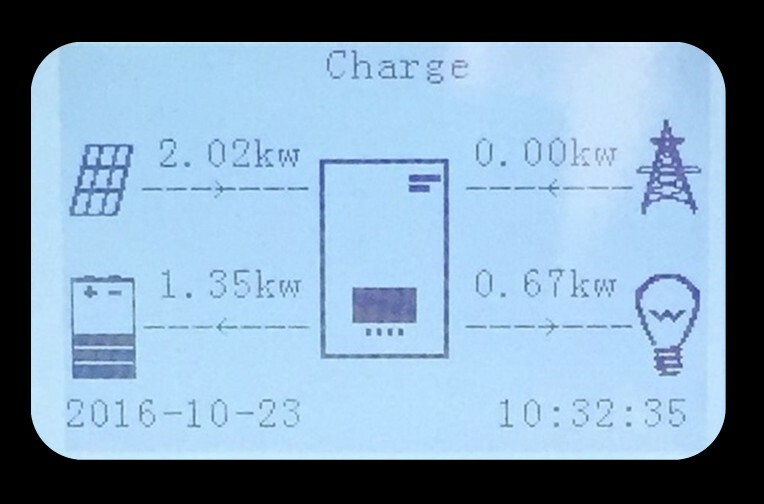 Simple Controls – the display on the SoFar Solar ME3000SP AC coupled battery storage system unit could not be simpler. It shows 4 power levels. The renewable generated power (solar or turbine) is top left, the battery power is bottom right, the property power usage is bottom left and the grid power is top right. With this system, if the renewable power does not satisfy the property, the SoFar Solar ME3000SP AC coupled battery storage system will ALWAYS export in order to minimise ever buying from the grid. Therefore the sum of the above numbers will always return to Zero! Simple Power Usage – The SoFar Solar ME3000SP AC coupled battery storage system power in the battery, and the renewable source is not covering the house load, then the SoFar Solar ME3000SP AC coupled battery storage system will deploy power. This is a huge improvement from a simple fill in the day and empty at night type of solution, as it means your batteries can fill and empty continually. Simple WiFi Monitoring – the SoFar Solar ME3000SP AC coupled battery storage system has free monitoring available. The App is available for smart phones and android tablets. This is via the customers router, and so this signal needs to be sufficient. The SoFar Solar ME3000SP has inbuilt Wi-Fi unit and antenna which is simple to pair to the property router. A FREE to download APP (Search RRGF) is then used to monitor the performance on iphone or android. Simple Battery option – The SoFar Solar ME3000SP AC coupled battery storage system works with an option of 1 to 8 of the Pylon Tech 2.4kw batteries. These batteries are stackable, and can be linked to allow a system to be increased in size – or reduced in size. The SoFar Solar products are not compatible with all Pylon Tech batteries due to ranging firmware, therefore the Pylon Tech Batteries are only supplied with SoFar Solar ME3000SP, and visa versa. Simple Warranty – The SoFar Solar ME3000SP AC coupled battery storage system has a simple 5 year manufacturer warranty which can be extended to 10 years if required. Full details are provided in the SoFar Solar PDF shown below. Simple Support – The installation of the SoFar Solar ME3000SP AC coupled battery storage system has proven to be simple. It is important to understand how the system works in order to always install correctly. 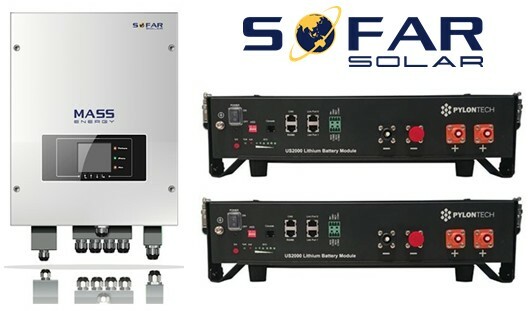 Infinity Innovations Ltd. are experienced in offering support and advise on installing the SoFar Solar ME3000SP AC coupled battery storage system before, during and after any installation. Contact us to get full support on this product BEFORE your first installation! New online videos are available on this page also. Optional Emergency Power Supply (EPS) – The SoFar ME3000SP AC coupled solar battery storage unit has an EPS function. This means that a dedicated supply can be set up to provide power in the event of power cut. This does not simply run the house consumer unit, it sends power to a pre-wired supply just to allow some lights to be plugged in, or a fridge until your power is restored. The available back up power will be determined by the level of power available at that time in your batteries! Some additional components are required for this function, so contact us for this information. Simple Battery Charging from the Grid – the SoFar Solar ME3000SP AC coupled battery storage system can be set up to charge the batteries from the Grid. In particular where some cheap rate electricity is available this is a great feature of the SoFar Solar ME3000SP AC coupled battery storage system. Simple Accessories - The ME300SP SoFar battery system allows easy addition of battery capacity. The number of batteries can be amended easily at any time. Please note that brackets for the stacking of batteries are not included in standard systems, and will need to be ordered in addition to any system. One pair is needed for one battery. Q – How long does it take for the battery to charge up? A – Energy storage solutions harvest excess energy which would otherwise be exported to the grid. This AC Coupled technology can charge and discharge the batteries at increasing rates depending on how many batteries are available up to a maximum of 3kw of charge/discharge rate. Check with your distributor for these rates. Q – Does the SoFar Solar ME3000SP AC coupled battery storage system work in a powercut? Q – Can you charge the SoFar Solar ME3000SP AC coupled battery storage system from the grid? Q – Can I add more batteries to the SoFar Solar ME3000SP AC coupled battery storage system? A – Yes, you can add up to 8 batteries per controller, the benefit of this is that it gives more storage capacity. Q – How can I monitor my SoFar Solar ME3000SP AC coupled battery storage system? A – Yes, through a free app that is compatible with both android and I-phone devices.